This initial volume is divided into two parts. In the first, the focus is on Karl Ove’s childhood, a rather unusual one spent shuttling between a physically-absent mother and a mentally-absent father, one who appears to be shutting himself off from the world. The second is centred on the father’s death at a young age, an alcohol-fuelled demise which turns out to be messier and more damaging than you could ever have imagined. In a very Proustian style of writing, Knausgård examines the aftermath of his father’s death in laborious detail, exposing the reader to many things they would rather not see – in a good way, of course. 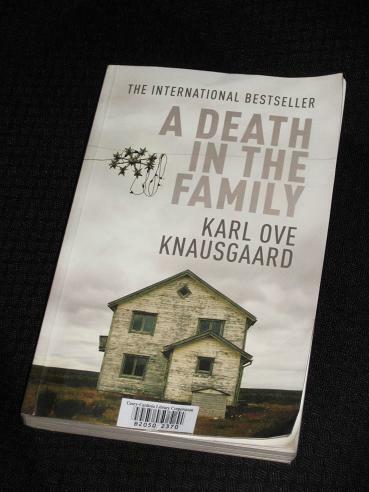 The dominant figure of the novel is, of course, Knausgård’s father. He is a strange character, a man seemingly trapped in a marriage and family he cares little for, spending as little time with his ‘loved ones’ as possible. It is inevitable that he will eventually go off the rails (although only the biggest pessimist could have predicted the manner of his spectacular demise), and it is every bit as inevitable that his son will wear the scars from his relationship with his father. A Death in the Family is definitely a fascinating work, but I’m not sure it’s for everyone. While some bits are enthralling (including the infamous seventy-page section where Karl Ove and his brother attempt to erase the squalid signs of their father’s last days), others are equally dull. One part I found extremely tedious was the story of a New Year’s Eve party Karl Ove attempted to attend in his teens, a good chunk of my life I won’t be getting back. I’m really not sure. It definitely deserved to be recognised in the longlist, but it is a little patchy (inevitable for the kind of style Knausgård attempts), and as I mentioned above, I’m not even sure if it is really a work of fiction. I didn’t recommend last year’s Proustian effort (Peter Nádas’ Parallel Stories) for the shortlist, and I think this one will be just outside my top six too. That’s all from Norway. Next time we’ll be heading south and west, with a brief stop in the Nertherlands before reaching our next destination – Wales. Tony – I am eagerly awaiting volume 2 of Knausgaard's opus, as I really thought this was a stunning book. I had a different take on the lengthy section dealing with the New Year's Eve party, which I initially found not dull, exactly, but rather baffling in its length and minutiae. It's only later that the passage seemed to make sense as a remarkable rendering of the directionless, drifting nature of adolescent life, the way in which one can be dependent upon later, concrete events to make sense of what one has lived: indeed, a good chuck of life none of us will ever get back, and therein lies the great poignancy of it. Not even located a copy of this one yet, at the moment reading Bundu, although I have now got access to Trieste & The sound Of Things Falling. Gary – I thought this would be one of the easier ones to find! Gary – Not sure if this might be the reason you're having trouble finding the book, but the British edition is entitled A Death in the Family, while in the U.S. it's published by Archipelago Books under its more precisely translated title, My Struggle. Stu – Definitely one of the favourites for the title. Even though I didn't love it, I can see it doing well, and I'm interested enough to want to read the next part of the story.